Over the course of a couple of hours with This War of Mine, I'd stolen food and medicine from an elderly couple, hidden behind a door and watched a soldier drag a young woman off with him to be raped, and stood uselessly by whilst one of the people I was supposed to be helping to survive died in her bed because I couldn't find any medicine. I also burned a treasured collection of books that a stranger had left with me for safekeeping, in order to stay warm. Shamefully, I actually felt worse about that last thing than I did about robbing the elderly couple; symbolically, there are few things more hopeless than burning books. And in my head, that elderly couple didn't stand much of a chance at surviving anyway. That's the kind of thinking that This War of Mine provoked in me: selfish, morbid, ruthlessly utilitarian. I was shocked at myself. 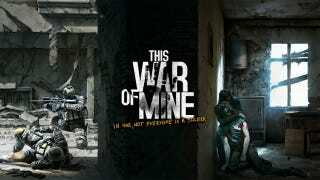 This War of Mine is set in a nameless city under siege in a non-specific war. It's contextless, in one sense, but there is always a political context for its story, wherever you are in the world. When designer Pawel Miechowski showed it to newspaper journalists in Israel and Palestine, it was seen as a depiction of the plight of their specific peoples. The names and backgrounds of the survivors, meanwhile, suggest a context closer to home for this Polish developer, 11-bit Studios: the Yugoslav wars of the 1990s. You start off with three survivors in an abandoned house that's been shelled half to destruction. During the day, you try to build things like heaters, beds, stoves and crude weapons out of whatever materials you can find. It's a little like a wartime Sims; you try your best to manage the survivors' hunger and mood, getting them to rest whenever they can, trying to numb their pain with moonshine or cigarettes. At night, when the shelling eases off, one of your survivors heads out to scavenge nearby buildings for food, water, medicine and new materials whilst the others sleep or stand guard. These places are rarely deserted. Sometimes you'll find someone dying there, whom you probably won't be able to help. More often, it'll be bandits, or soldiers, or armed survivors trying to protect themselves and their meagre property. Very quickly, This War of Mine starts putting you in situations where you have to screw someone else over in order to survive - or where your efforts to find some food are likely to get you shot. Going out scavenging is intense. You must move quickly and quietly, peering through keyholes before opening doors, looking and listening for danger. Sometimes you have to hide from lookouts, sometimes you have to saw through bars to get at valuable salvage. Sometimes you'll be working on a door with a crowbar, and suddenly the noise will bring someone running at you with a gun, sending you sprinting for the nearest exit. The one time I tried to actually engage in combat, it did not go at all well; unsurprisingly, the former cook that I'd taken out scavenging wasn't a great shot. He barely escaped with his life. It is relentlessly bleak. The visual style - characters and buildings are rendered in shifting monochrome with barely any colour - contributes to the sense of unease and desperation. The writing - much of which is placeholder at the moment - offers small insights into the characters you're tasked with helping, and how the events of the war are affecting their mental and physical state. It was eleven days before one of my survivors was dead, and the other two were irredeemably depressed and well on the way to starvation. One night I came home with a huge stash of food, only to find that raiders had robbed our home base of all our vital medicine and bandages. I'd genuinely hoped we might be able to get back on track, but the game trashed those hopes in seconds. There is no winning in This War of Mine, really. The war will eventually end, after an unspecified time - months, probably - but all you can do until then is get by. I'd built up what I thought was a pretty impressive selection of rainwater collecters, heaters and other survival equipment, but it didn't stop Katia from dying. If the pre-release demo hadn't cut me off after two hours of play, I'm pretty sure Pawel and Bruno would not have been far behind her. A potential weakness in This War of Mine's portrait of wartime survival is that there is little room for nuance. If the game decides you've done a Bad Thing, that's that, however hard you might try to find a third way. When I stole from that elderly couple, I only took what I absolutely needed; I sure as hell didn't hurt them. In my head, that made it… well, not OK, but not the worst thing I've ever done. In my character's head, it was much worse. He was depressed for days. I wish that I'd been offered the option to trade, or come to other kind of compromise. It felt like the game was trying to force me into making a terrible decision. The reality, though, is that war does force people into making terrible decisions. There just isn't a third way. To save yourself, you have to hurt other people - directly or indirectly, whether that's by taking a shot or stealing from them or just standing by whilst something awful happens. Thinking about that, and about what real people must go through in situations like what This War of Mine depicts, it suddenly felt disgustingly, shamefully petulant and naive of me to demand some kind of victimless option that would make me feel better about myself. That's not how war works - and This War of Mine is not interested in feeding us some sugar-coated approximation. This War of Mine is out in just over a week. It is partnering with War Child to raise both funds and awareness for children during wartime, as part of the charity's campaign to "engage players and developers of war games in the reality of war for children". Players will control the kind of ordinary citizen who the machines of war usually roll right over.